War photographer Sarah Goodwin has just come home from the Middle East, barely in one piece. Which means she’s in about the same shape as her longtime boyfriend James, a writer who also has been covering the war. He’s a recent returnee as well. 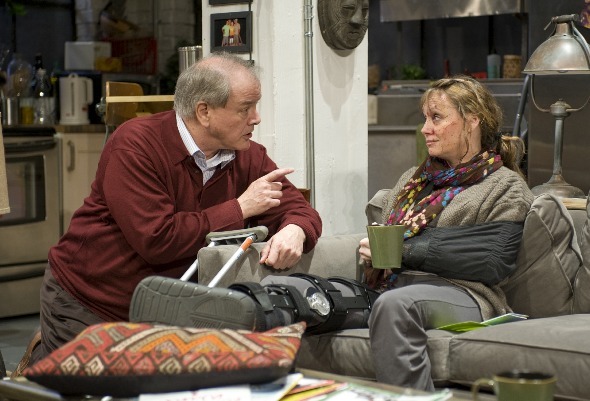 You could say these two characters in Donald Margulies’ play “Time Stands Still,” mounted with harrowing intensity at Steppenwolf Theatre, are regrouping together. And yet separately. Sarah and James still see what’s going on over there – the calamity of warfare and destruction – in the same way, but now from radically different perspectives. She may be the one who takes the pictures, but they both have their personal images of the mayhem that no viewfinder can contain – the horror they can practically taste. Perhaps it is a ghoulish thing they do, but doesn’t someone have to do it, to help the world understand what’s happening, what it’s like? And they’re both masters of their craft. Yet, when is enough enough? That’s the question and the rub, the human quandary, the thing – unspoken at first – that tears at these two souls. 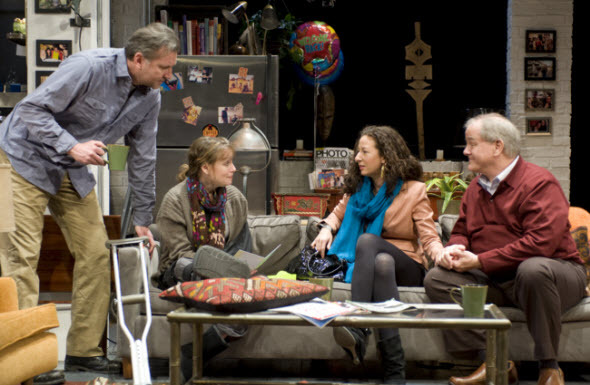 By now I’ve seen several productions of “Time Stands Still” including its Tony-nominated 2010 Broadway run, and each time I’ve revisited Margulies’ concise, perceptive, tumultuous play I’ve come away more certain that its title is a paradox. A moment captured in an image remains ever thus, as constant as it is perfect in its beauty or mystery or grotesqueness. But time as we live through it, and alter with it, does not stand still. Eternal summer lasts only in sonnets, or frames. “Time Stands Still” might be construed as a photographic record of its own paradox. It’s a time-lapse sequence of the real world in flux, to be flipped through as you will, in slow motion or in haste: Attraction. Love. Sharing. Growing. Together. Apart. Lonely. Needful. Pain. Change. Renewal. That’s the photo album Margulies opens to us here. It’s powerful stuff. Not tragic, but deeply poignant in its conviction and compelling in its truth about the resonances of battle trauma. “Time Stands Still” might also be just too intense to bear except for the decompressing presence of its two other characters, a middle-aged magazine photo editor and his very young, slightly ditzy new girlfriend. To say this girl – an event planner by profession — really doesn’t get Sarah the war photographer, and vice-versa, is to say there can be considerable comic relief at hand. That said, director Austin Pendleton’s lean, driving approach trims the comedy as he ratchets up the tension. 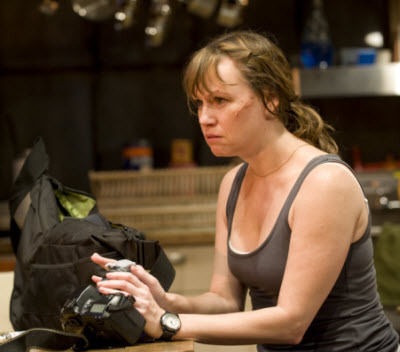 Pendleton’s laser focus is personified in Sally Murphy’s tightly coiled Sarah, whose compressed, expostulatory speech seems to require two breaths to get one sentence out. Murphy’s convalescing photographer is one obsessive woman, perhaps like any artist. Then again, the photographer is lucky to be alive. She was blown sky-high by a roadside bomb. Here, Sarah is also effectively shorn of her sense of humor beyond the sarcasm rooted in the playwright’s words. She is the alienated daughter of a rich father, and one suspects Pendleton sees her as prime candidate for psychoanalysis. Her boyfriend James, grappling with his own profound wounds from the war, is played on the edge between hope and desperation by Randall Newsome. It is a sympathetically human and credible performance. It’s to the credit of both actor and the director that James, now in the role of care-giver, inhabits the couple’s cluttered Brooklyn apartment with such familiar ease. Designer Walt Spangler’s finely detailed set bears a pragmatic realism: cleaning supplies lined up under the sink, a note-covered fridge that occupies a back corner of the living room, the armoire that provides the only partition between living space and bedroom. This is Sarah and James’ place, and that palpable truth adds to the melancholy of events. As counterparts, foils and catalysts, Francis Guinan brings a lusty energy and ample humor to the couple’s shared editor and friend Richard, and Kristina Valada-Viars offers a surprisingly grounded take on Richards’ young, unworldly girlfriend. With so much of the play caught up in the tension between Sarah and James about what’s next for each of them, the positive energy, life and indeed light that Guinan sheds is critical in preventing this dark production from running aground on shoals of misery. And Steppenwolf’s interpretation literally begins in darkness, whether the choice of the director or lighting designer Keith Parham. The first several minutes are played in virtually no light, and the effect pulls you in with squinting concentration. Is this a moment of rebirth, the dark void? Indeed, when the lights come on, what we observe as a cluttered nest proves to be a blank, formless place where two lives will be reconfigured.